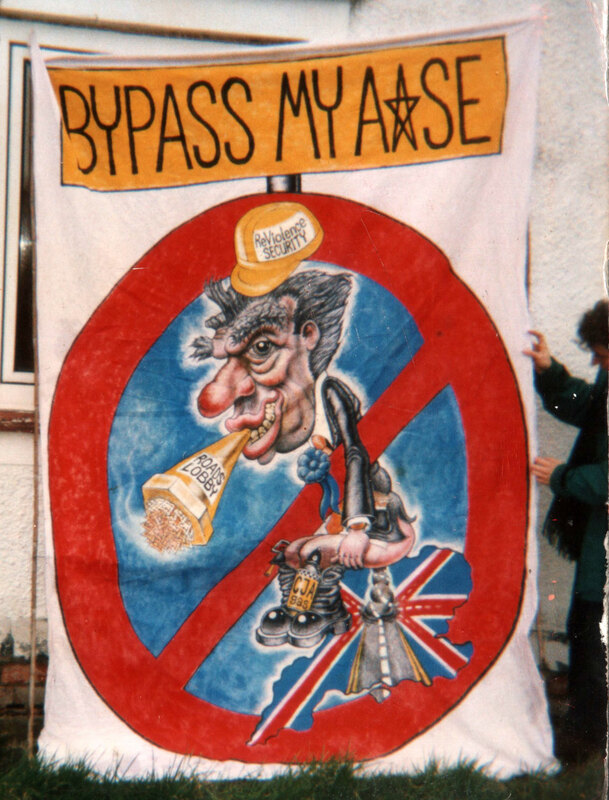 I have painted hundreds of banners over the years, and show a few of my favourites below. Most are painted with acrylic paint (water-based and expensive, but quite weather-proof) onto old sheets or curtains or cheap sheeting material. A few are not painted but printed by commercial printers (usually using PVC-free polyester canvas). 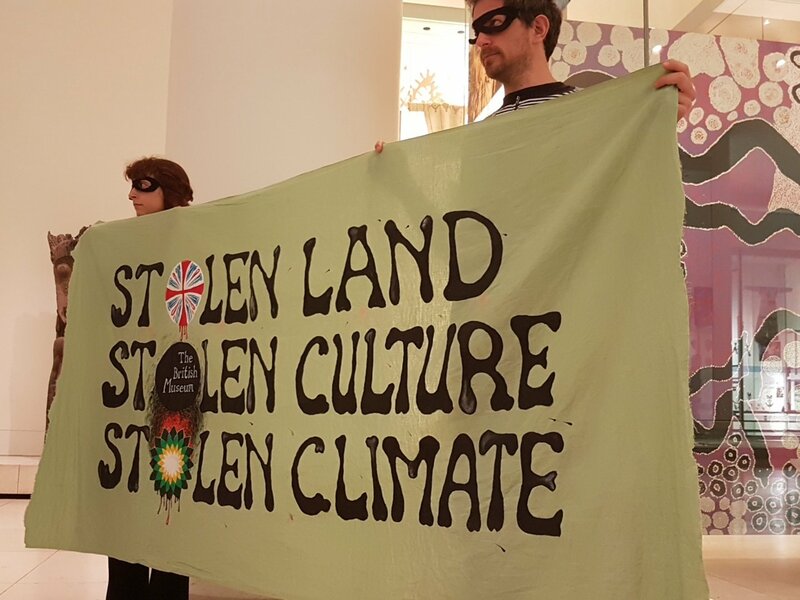 Banner for the BP-or-not-BP group to assist in a 2017 protest at the British Museum in London, who were taking BP sponsorship money to pay for an exhibition of artefacts stolen from Aboriginal communitites in Australia. 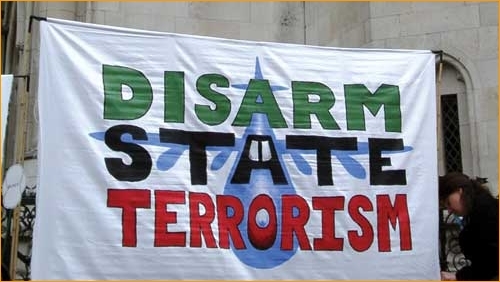 This banner was a fairly accurate hand-painted copy of a banner I made two years ago, that was covered in signatures of support and posted to the indigenous campaigners in Australia. 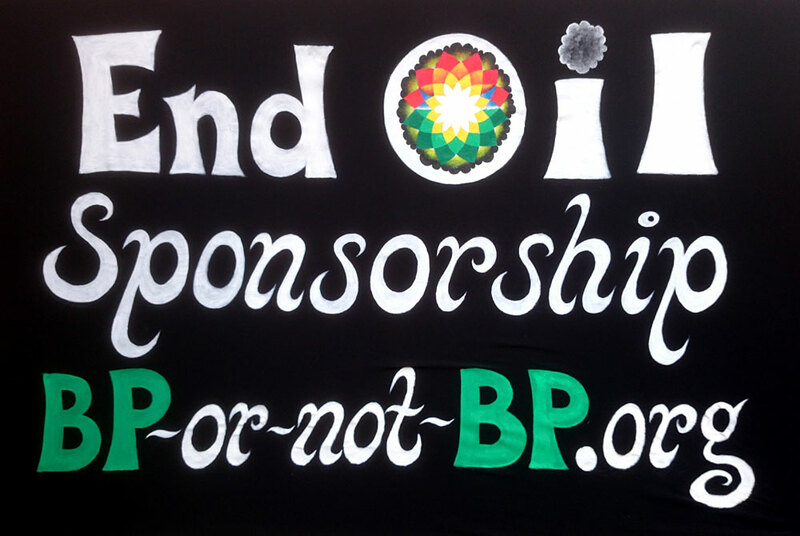 Banner for the folks at BP-or-not-BP? who were stunned to discover that BP were sponsoring the 2016 exhibition at the British Museum called Sunken Cities. The exhibition features new archaeological findings from two underwater communities off the north coast of Egypt. 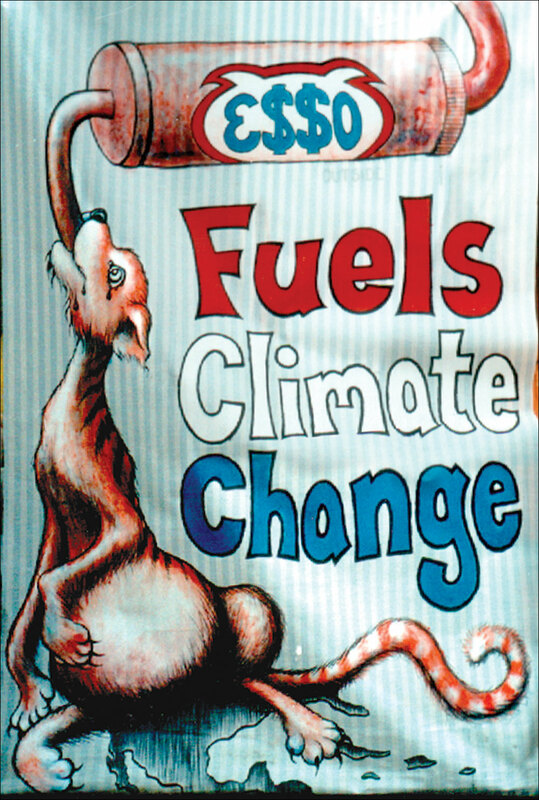 As most of us know, climate change is caused primarily by burning fossil fuels, like those sold by BP. One of the many devastating effects of climate change is… rising sea levels that leads to… sinking cities. 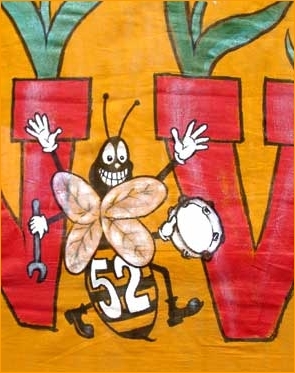 This banner was used to peacefully protest against this flagrant debacle. The next day 14 daring climbers from Greenpeace UK climbed the 7 vast columns in the forecourt of the British Museum to hang seven tall banners that spoofed the BP publicity – each banner explaining how severe floods had led to 7 key cities to be recently flooded including Hebden Bridge, New Orleans and Manilla. A kite that is ALSO a banner, for the excellent 2016 international “Fly Kites not Drones” day – a growing day of fun and excercise that also protest against the use of armed drones in many poor countries ofthe world, particularly in the Middle East. 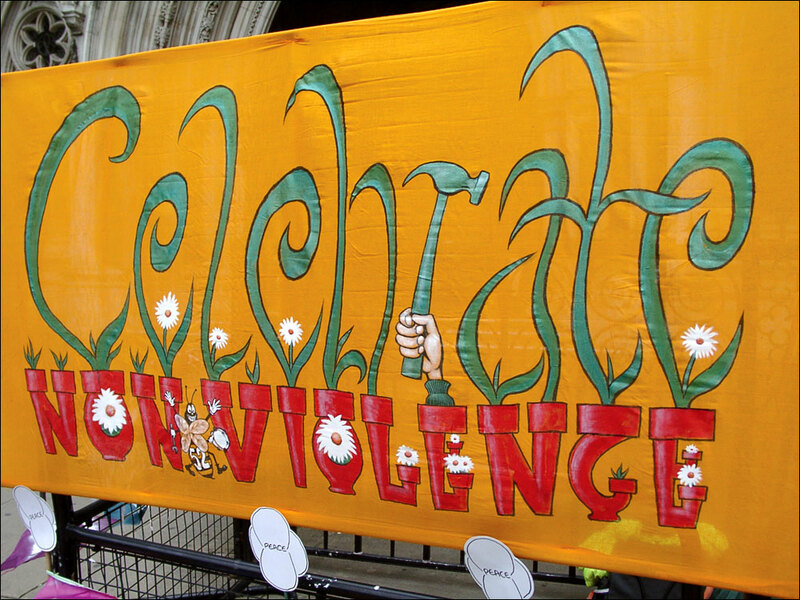 This banner was also a gift for the wonderful people at Voices for Creative Non-Violence UK who were one of the groups behind this annual kite-flying day. VCNV UK work with various peace and justice initiatives, mostly in Afghanistan, often with street children. These photos are from the Oxford FKND day on March 19th 2016. Ed made a great little film of it, here. 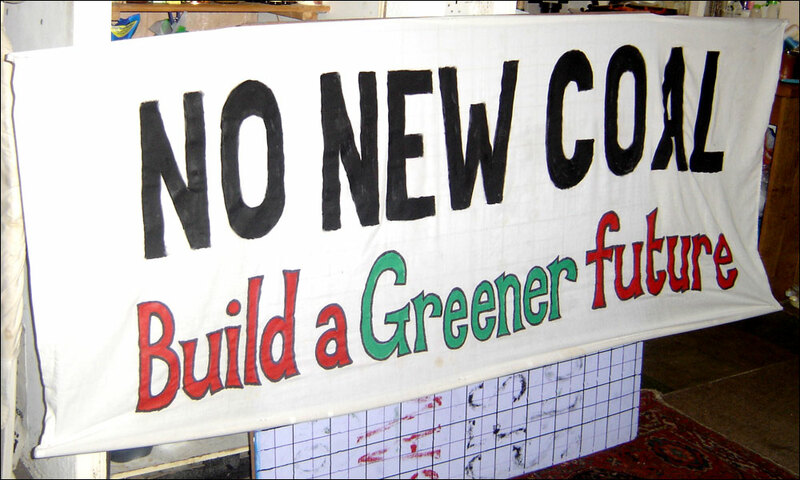 Three small banners for the many folks campaigning for Oxford Churches, Oxford University and Oxford County Council to withdraw their investments from fossil-fuel companies. 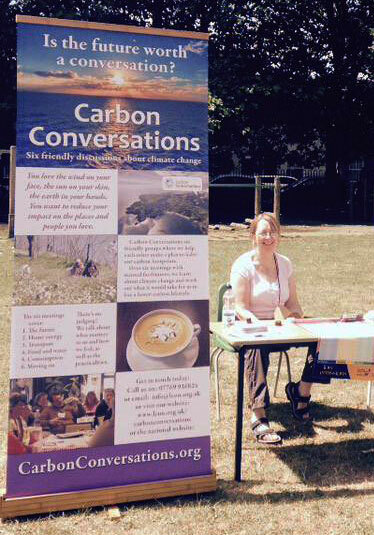 This photo was taken on Sat 14th February 2015 in the Centre of Oxford on Global divestment Day. For more info please see GoFossilFree.org and also 350.org. Technical note: the banners have rigid bamboo canes in their top hems and in their bottom hems – this is a simple trick that keeps the cloth spread out, making the text easily readable. The side poles are simply resting inside short plastic pipes that are gaffered to the top-pole – these side-poles come out and can be rolled up inside the cloth for easy transport and storage. and is spreading across Britain and beyond. 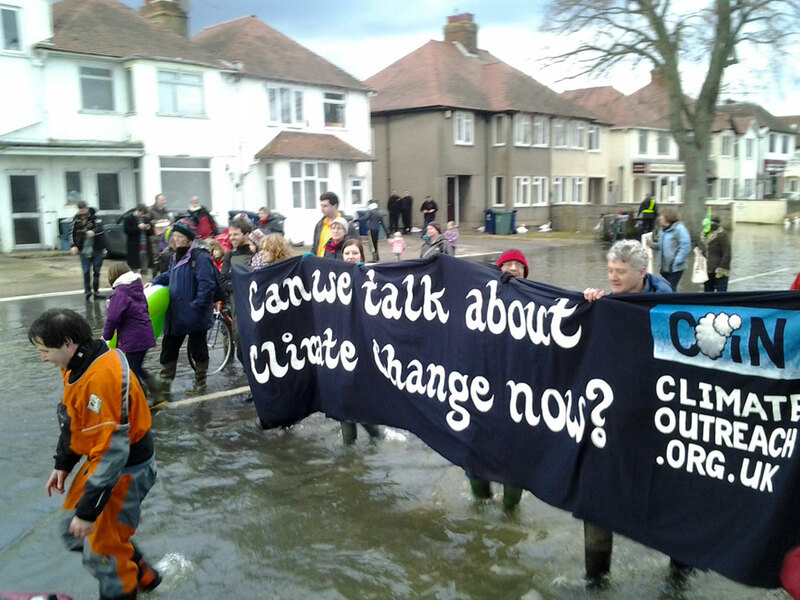 useful UK projects to help tackle climate change. and good clear titles can draw people over. people can still learn a lot. 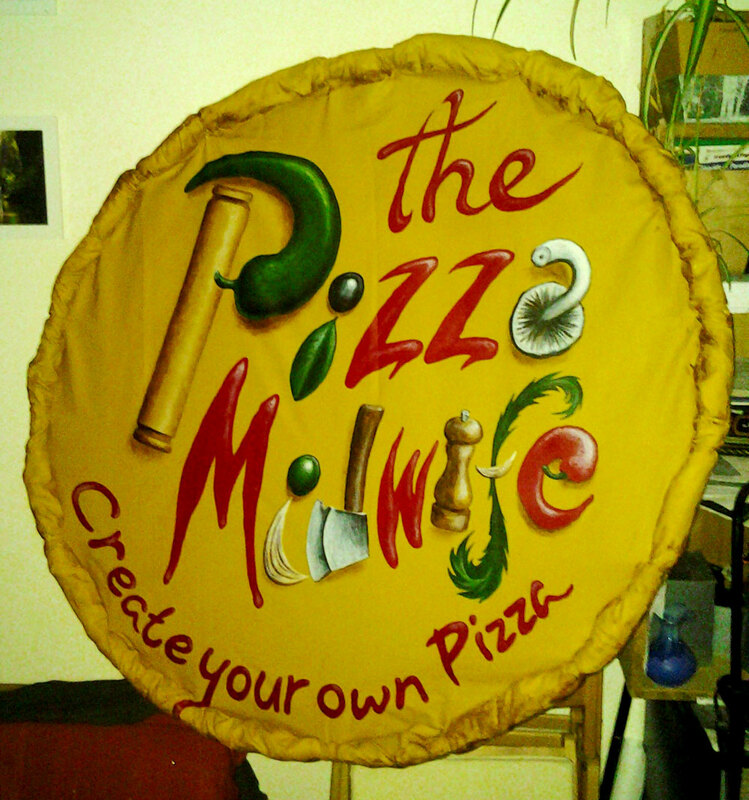 A small banner I painted with Miriam and Katharine. 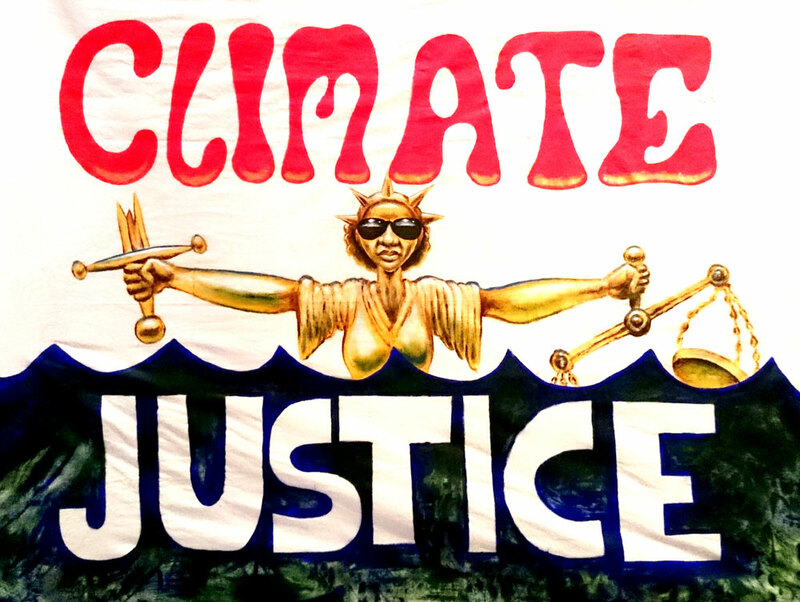 This banner was first used at the recent “Time to Act” march in London on Saturday 7th March, where between 10,000 and 40,000 people (depending on who you ask) marched for action on climate change. 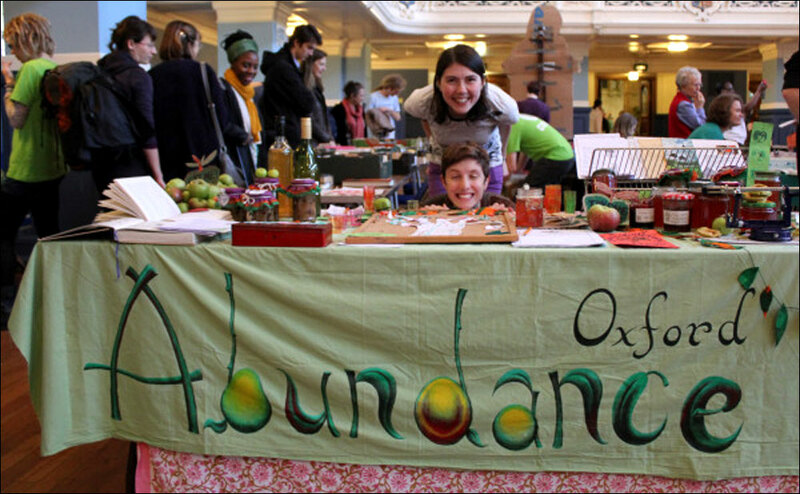 A 2014 banner for the Oxford Disco Soup collective – a project of Abundance Oxford and Good Food Oxford – part of the Pumpkin Festival, where we are asked to “squash food waste”. Disco Soup is a gathering of people who prepare a wholesome vegan soup using food that would otherwise go to waste. The soup is offered to anyone who wants some, for free. All this happens to bouncy live (and recorded) music in the hope that folks dance, chat and enjoy a ‘meal together’. The underlying message is that we can and should throw less food away. 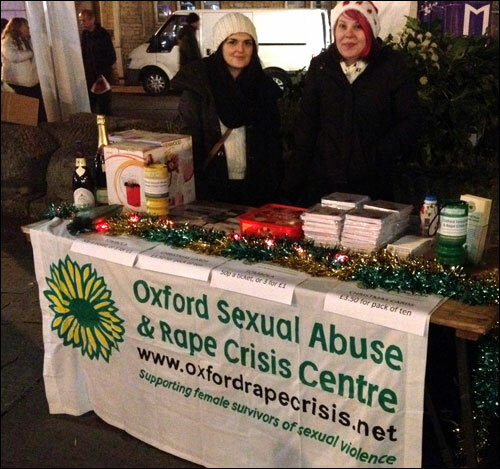 Oxford’s third Disco Soup was held in 2014 – it was a great success feeding over 800 people. Green TV made a short film about it here. 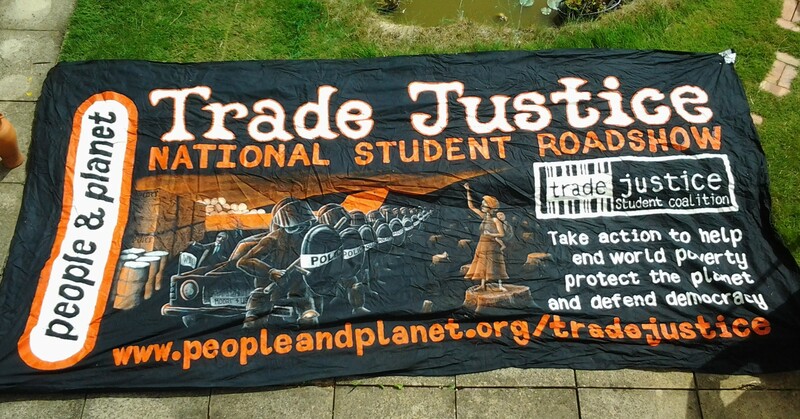 Sadly theis banner got lost after just one use – if you see it, please get in touch. 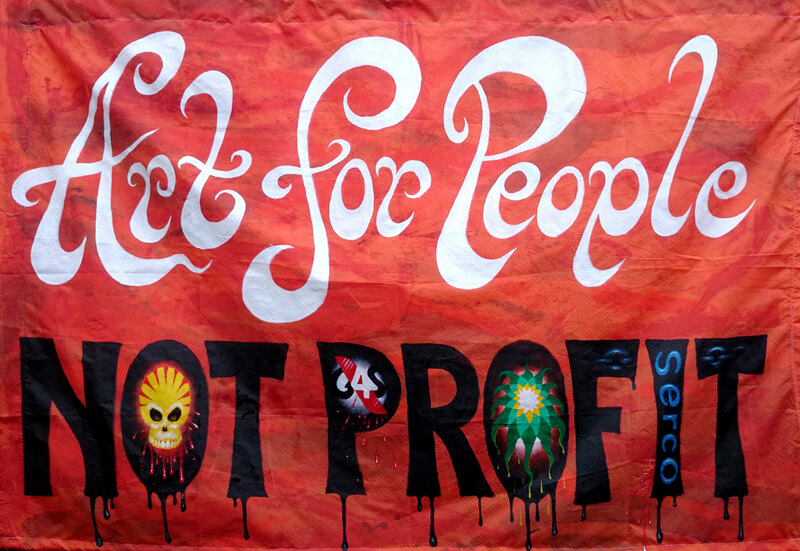 Banner for the folks at BP-or-not-BP and ShellOutSounds who invaded the launch party of the new Rembrandt exhibition at London’s National Gallery yesterday (14 October 2014). 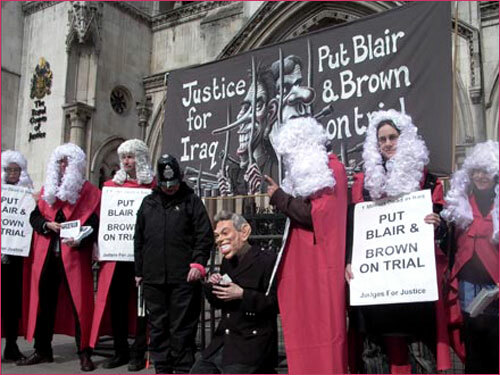 They performed a short and fun ‘faustian’ theatrical show with masks and costumes criticising the National Gallery for accepting Shell sponsorship and for planning to privatise about two-thirds of their staff. 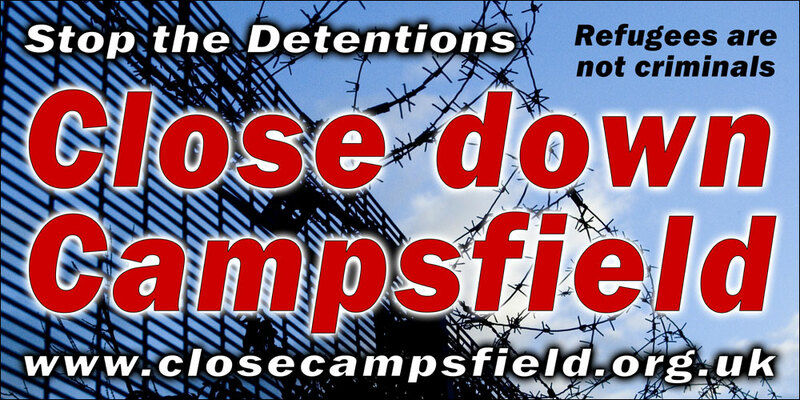 G4S and Serco, infamous for ‘running’ prisons and refugee-detention-centres, are likely bidders for the contracts. 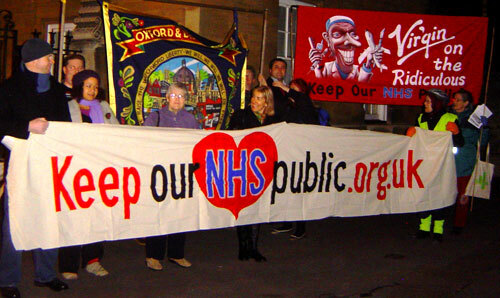 This action was done in solidarity with PCS union, who today are on strike over the proposed privatisation / sackings. See a full description of the stunt HERE – including a short video, and the script from the performance. Well done to all involved! The audience listened and clapped along as the choir sang verses based on Shell’s polluting activities in the Niger Delta, the Canadian tar sands and the Arctic, and applauded as the singers unfurled a banner reading “Oil in the Water” and bearing an evil-looking Shell logo. There was further applause as the song ended, and the choir then proceeded to the bar where they performed again before leaving the building. Security guards looked on but did not interfere. Photo of action by Hugh Warwick. 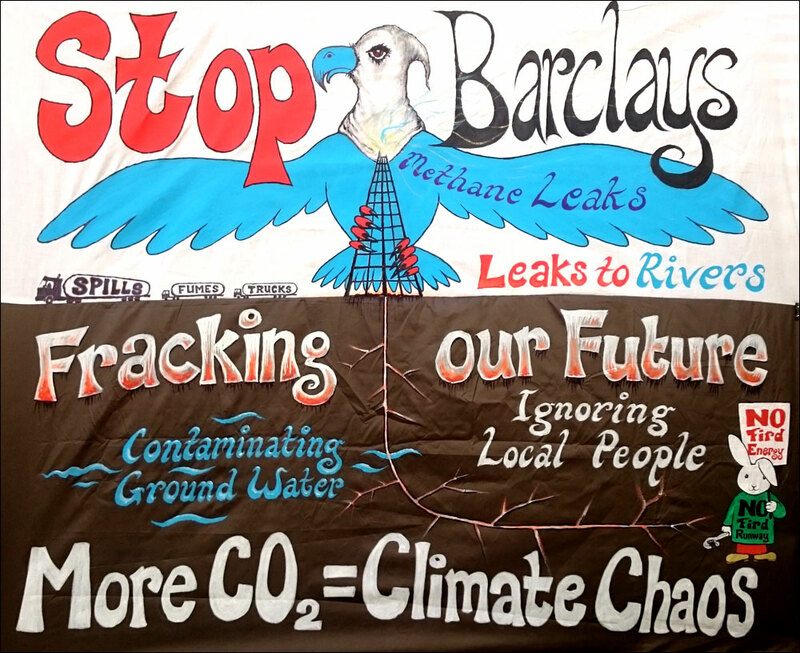 The flyer that was handed out at the event, and the lyrics of the altered song, together with lots more info on Shell’s activities are on the Shell Out Sounds website. I am reminded of the words of Ken Saro-Wiwa (the murdered Nigerian poet and anti-shell activist) who said: “You cannot have ‘art for art’s sake’…art must do something“. 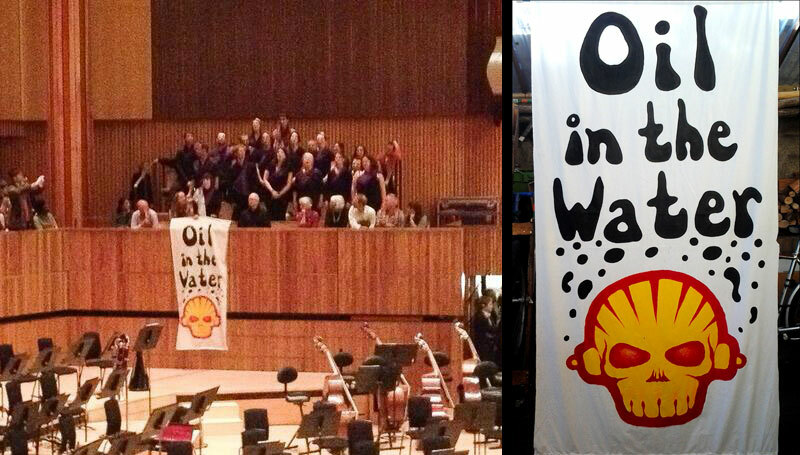 In January 2014 we learned that the South Bank Centre would no longer let Shell sponsor their shows. 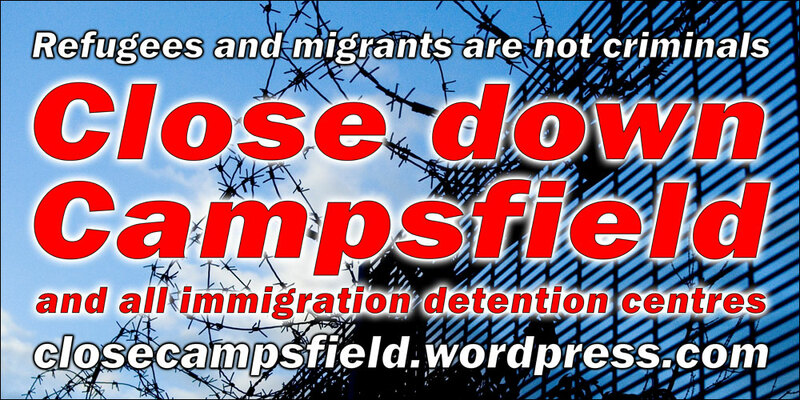 After nearly a decade of protest… we won! Poeple power! This is a 3-meter long banner that I designed for SOFACoMAC. We got Seacourt to print it on a new special PVC-free material. Seacourt are one of the ‘greenest’ printers around and their non-PVC banners cost about £50 per square meter. 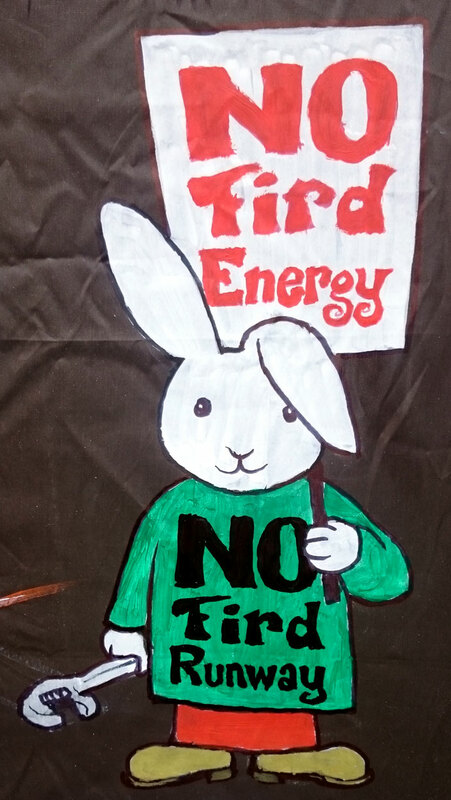 It’s made of a polypropylene which is non-toxic, “recycle-able” and while still a petroleum product, its manufacture is a lot less harmful to the environment than PVC banners. 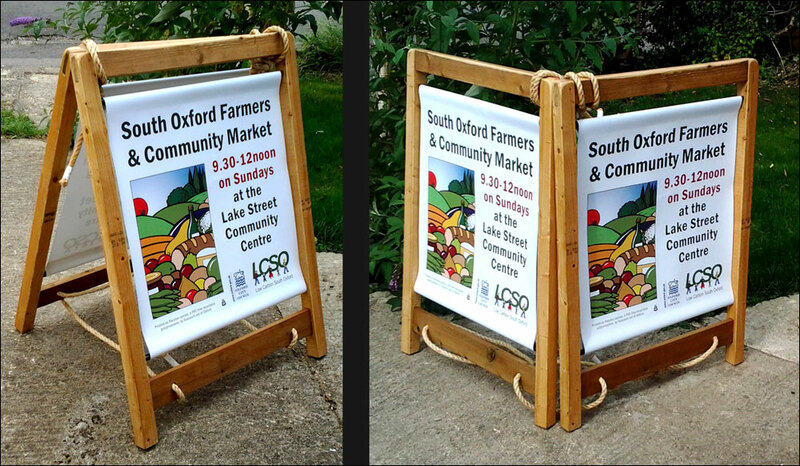 Below is the matching A-board I made. The hemp-rope ‘hinges’ slide across so the rig can either open from the top, like a standard A-board as shown, or it can be hinged from a side, allowing the structure to wrap around a tree or lamp-post if needed. 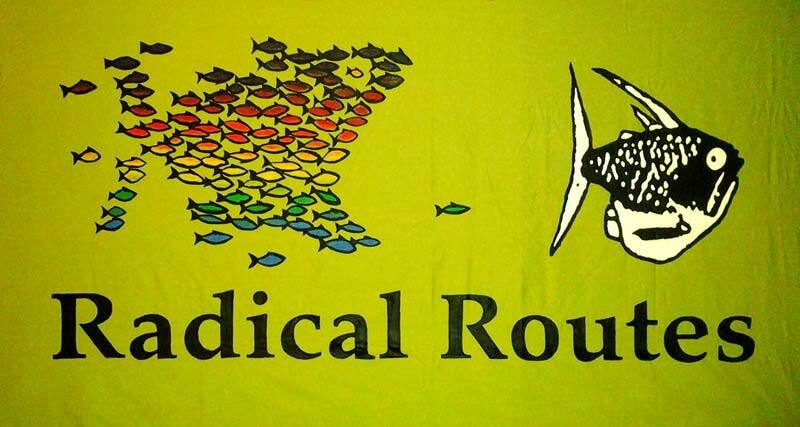 This long banner was made in 2009 for Radical Routes. It has a main central section that fits on the front of a standard ‘stall’ table, while the two ‘side’ sections then handg on each side of the table. In some settings the full length banner can be displayed. BTW: Putting a banner up on wall behind a stall is often much better than hanging it from a table front because once you have a few people standing in front of your table, they obscure the banner. 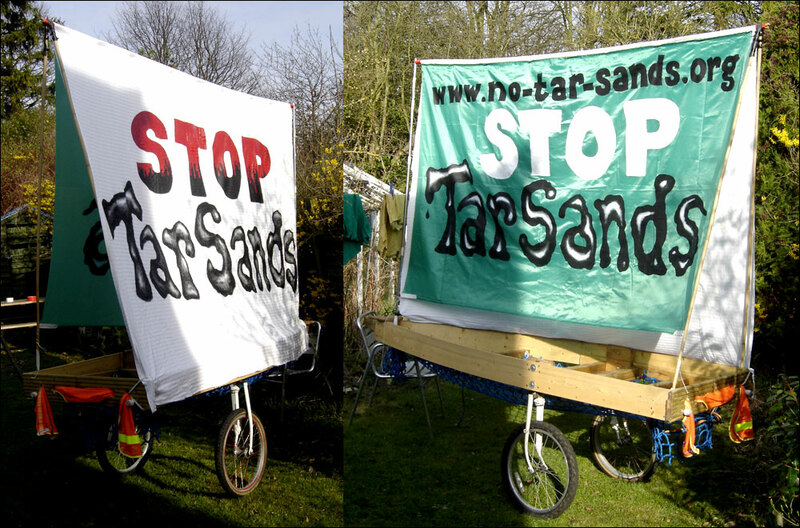 It is wise to use a permanent marker and write a contact phone or email address on the back of banners, especially when many different people are likely to borrow / use it! 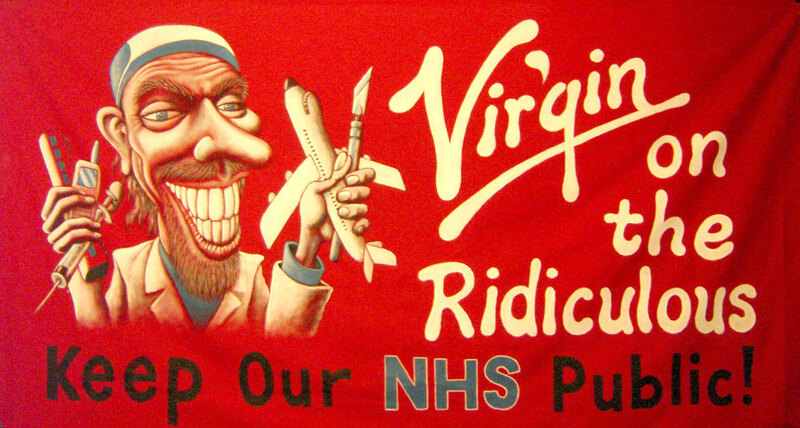 “Virgin on the ridiculous” banner from around 2007 for the Keep Our NHS Public campaign. 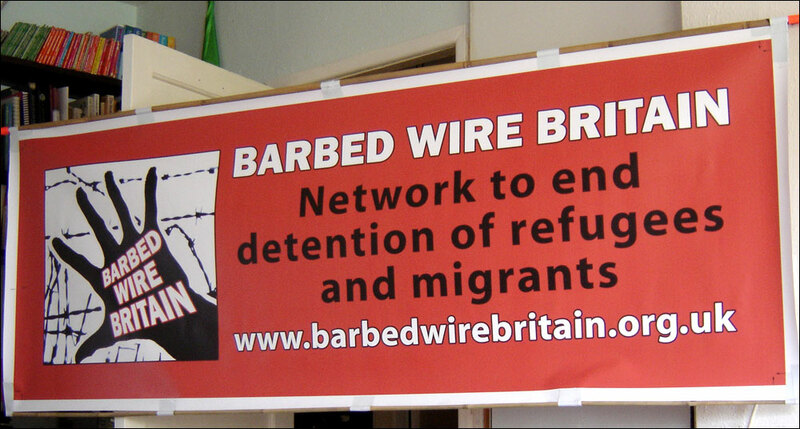 Banner for Barbed Wire Britain. 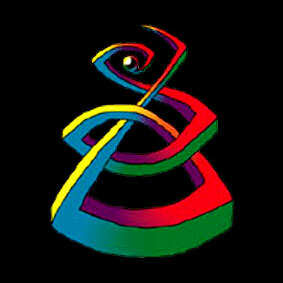 I did not design the logo. 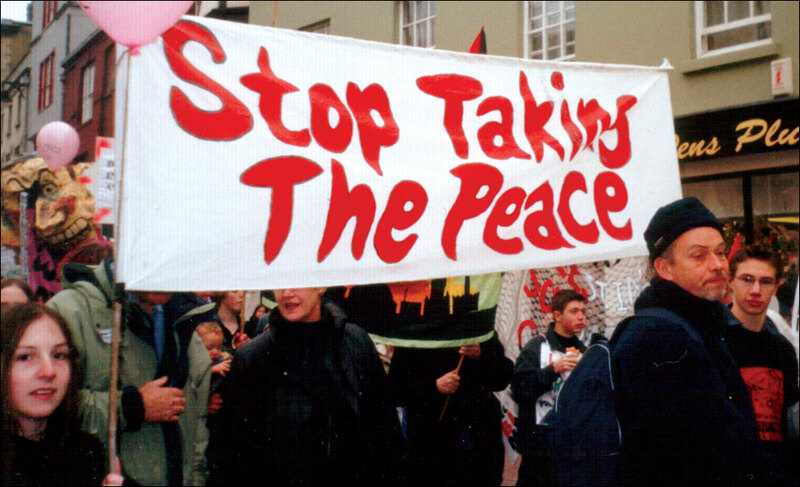 Around 2007. 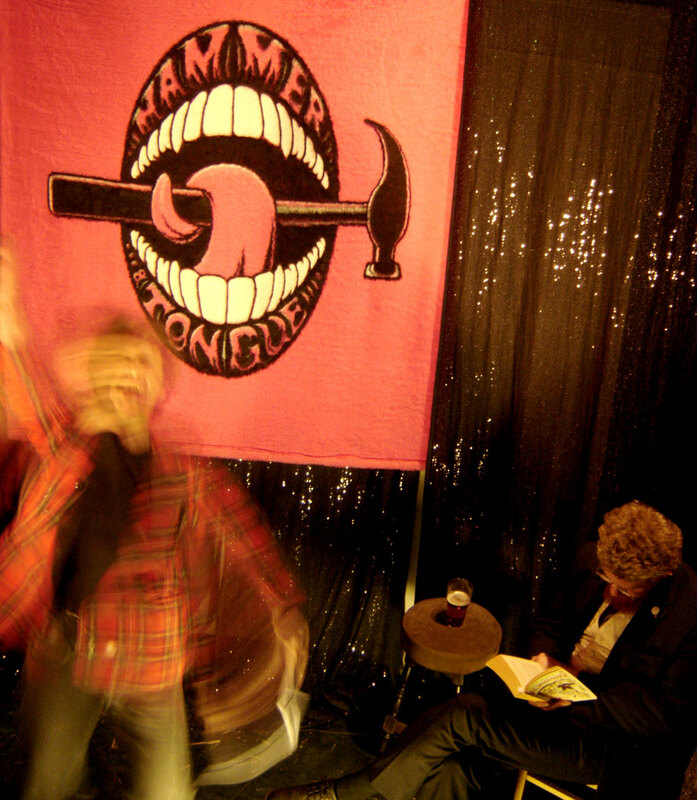 This banner was painted on a square of flourescent fake fur in 2004 for Hammer & Tongue, Oxford Slam poetry posse. The performer on the left is Scotland’s finest Elvis McGonagall (often on Radio 4 apparently), while the chap sharing the stage and politely reading a book on the right is Bristol’s A. F. Harrold. They were performing at the wonderful 2-day poetry extravaganza called the “Live Literature Arena” at the Rotunda, Grove House in East Oxford. 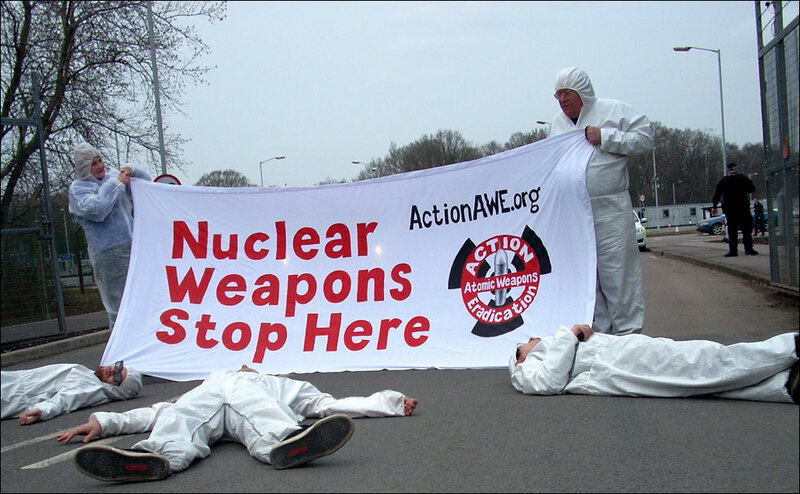 This small banner was displayed outside the court of another appeal hearing for the B52. (see explanation below, by 2003). 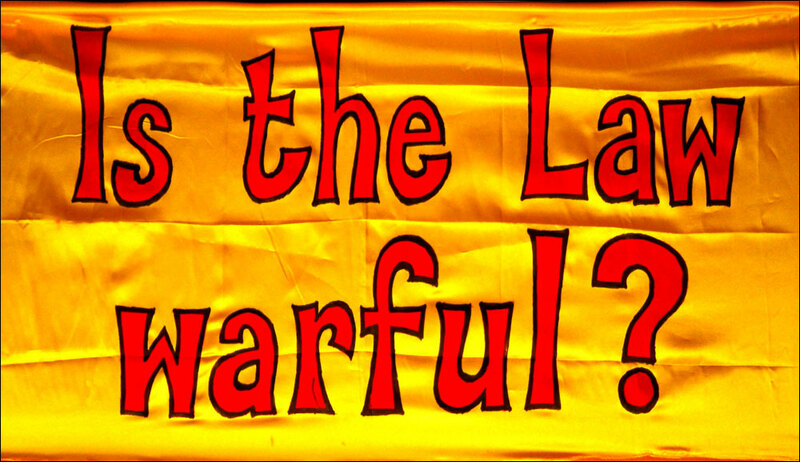 Apparently the prosecuting lawyer asked the judge to do something about this “contemptible banner” that was hanging outside the court. The judge refused saying that he thought it was “quite funny”. 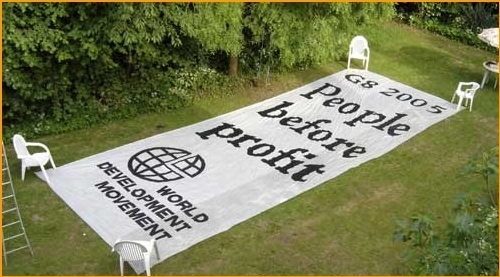 Banner for WDM, for the G8 meeting in 2005, painted in the beautiful garden of Grove House in Iffley Village. 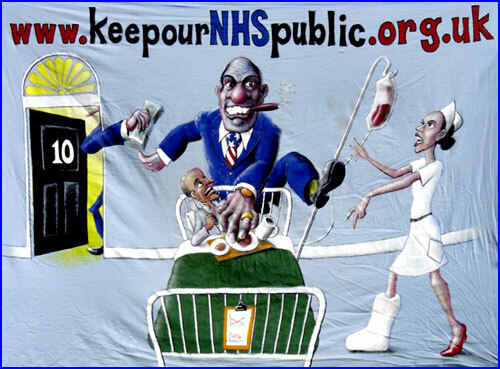 This large banner was commissioned by the late great Guy Hughs. 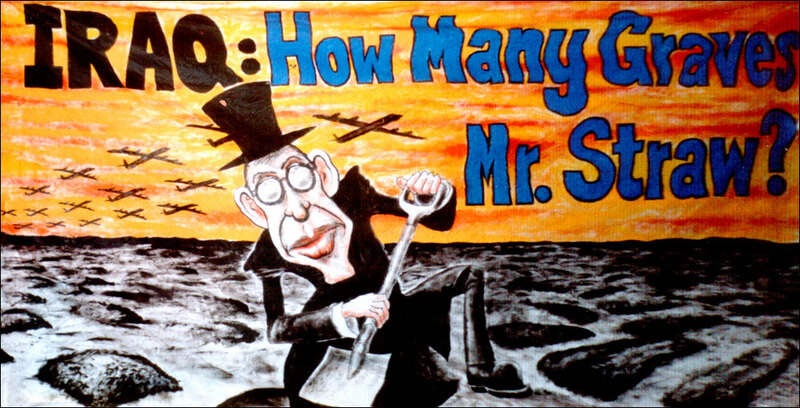 He had asked me to paint this onto the side of a large orange mini-bus that People & Planet had bought, in order to travel around the UK on a ‘Trade Justice’ Roadshow. I had strong reservations about painting on a van – it would fix the artwork to always be outdoors, and also, I hated petrol-powered vehicles. 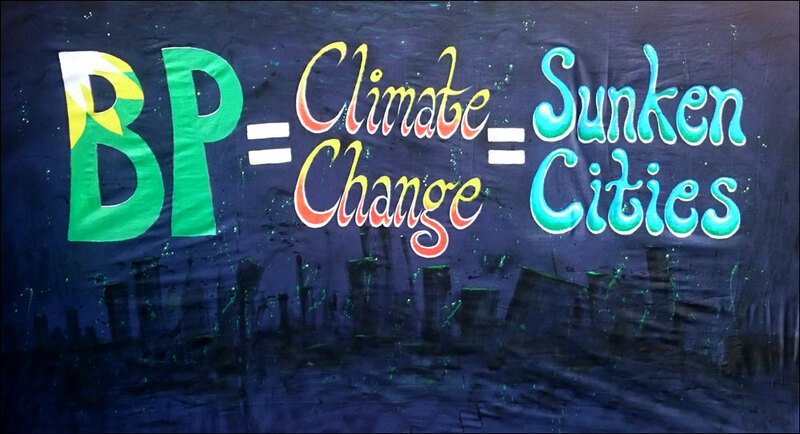 So he got me to paint the design on a big sheet instead, which was used on the Roadshow, and also allowed the banner to get used indoors as well. I was delighted. were eventually found NOT guilty, and released. of hundreds of thousands on innocent people. The close up on the right is from the above banner. 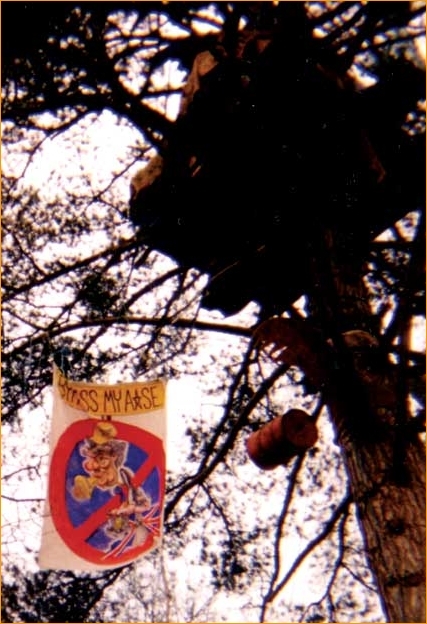 Above is a poor photo of my first banner, hung from the tallest tree on the route of the Newbury Bypass, back in 1996. 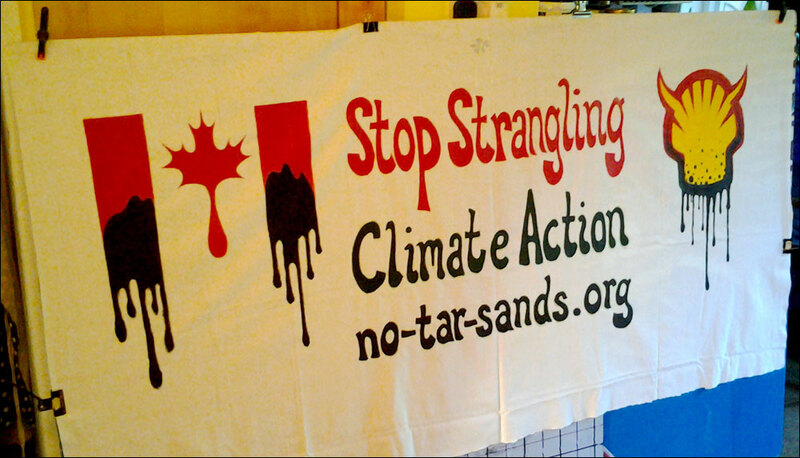 Below is a better photo of the banner. Newbury was an incredible campaign that saw thousands of people try to get in the way of building a bypass around the town of Newbury. An estimated 10,000 trees were cut down to make room for the new road, which was going to take about 2 minutes off the time it took for motorists to get through Newbury. 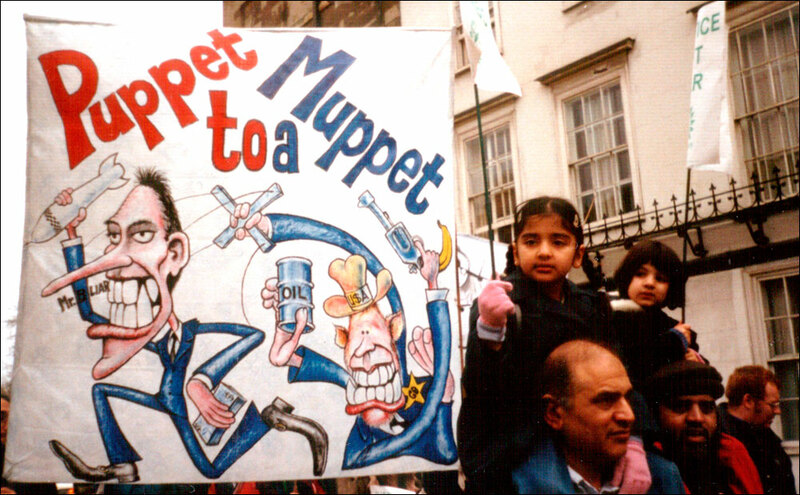 While the ‘Third Battle of Newbury‘ was a battle we lost, we sort of won the war, as in 1998 the Tory government cut most of their planned new roads. 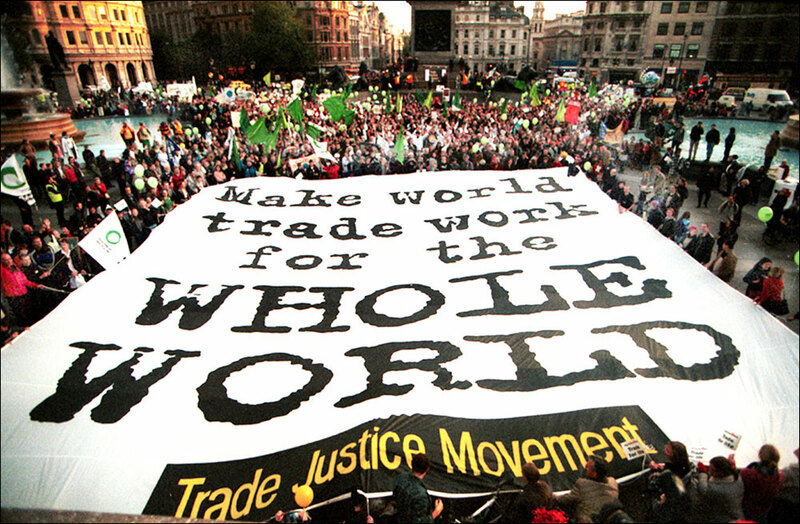 The new Con-Dem coalition government is trying to bring back many of these new roads and the tree-protesters are back! 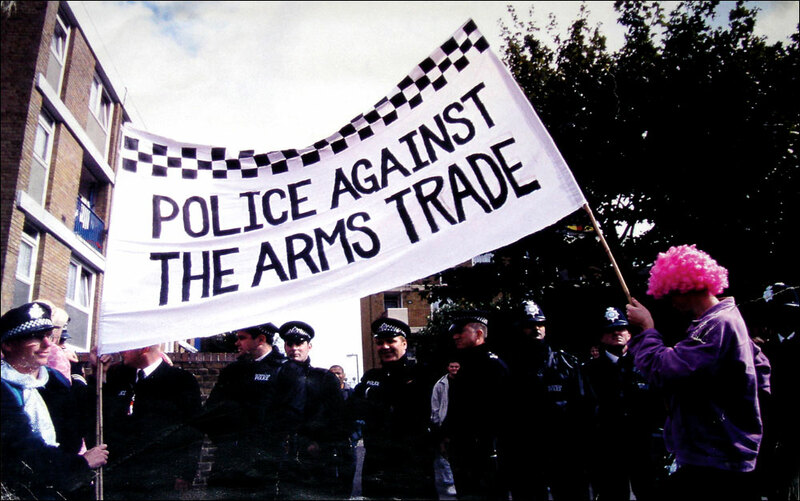 One of the first new roads to be contested is the Hastings-Bexhill bypass, being blocked by the Combe Haven Defenders.